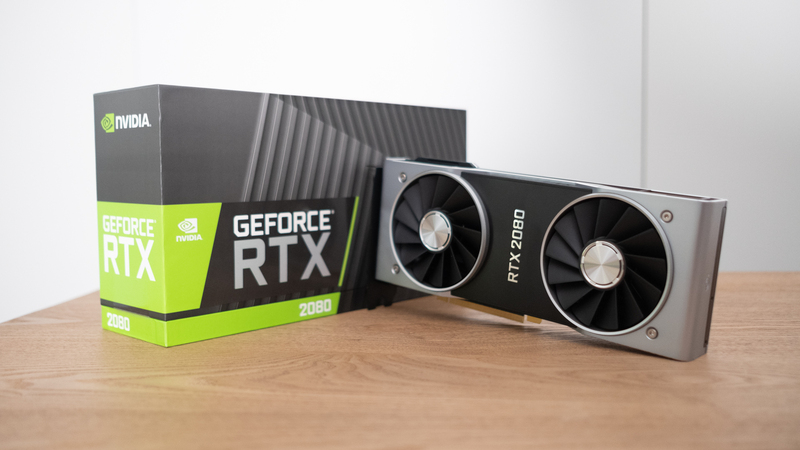 >> Breadcrumb :Home/Audiophile blogs/TechRadar/Nvidia GeForce RTX 2080 Ti vs RTX 2080: which should you buy? The Nvidia GeForce RTX 2080 Ti and RTX 2080 are still in their infancy, bringing about out-of-this-world PC gaming performance. Finally, 4K 60 frames-per-second (fps) gaming is attainable on a single card without having to compromise on visual quality – who wants to run their games on medium, anyway? However, now that the dust has settled and users have had these cards in their systems for a while, it’s time to put the RTX 2080 and the RTX 2080 Ti head to head to see which card makes the most sense for your system. Now, we know that when it comes to sheer horsepower, the Nvidia RTX 2080 Ti is going to absolutely dominate, but that’s not the only factor, regardless of what some people may have you believe. Price, performance, target resolution are all key factors, along with the kinds of games you play. So, let’s dive into the nitty-gritty. One of the most notable things about the Nvidia Turing line of graphics cards is just how expensive they are over the previous generation. If you’re looking to upgrade, you’re looking at dropping at least $499 (about £380, AU$700) on the RTX 2070 – which is much weaker than either of the cards we’re paying attention to today. If you want all the possible performance, with zero compromises, you’ll have to drop at least $1,199 (£1,099, AU$1,899) for the RTX 2080 Ti. This is a huge jump over the previous generations GTX 1080 Ti, which launched at $699 (£699, AU$1,129). If that’s too rich for your blood – and, really, we can’t blame you, you might find the Nvidia GeForce RTX 2080 more palatable, starting at $799 (£749, AU$1,299). This is still an expensive card, but, hey, it’s under a grand and that’s something. Unfortunately, neither of these cards are very budget-friendly, so it’s just a matter of how much you’re willing to fork over for the best graphics card. In terms of raw specs, the Nvidia GeForce RTX 2080 comes with 8GB of GDDR6 VRAM with a speed of 14Gbps on a 256-bit bus. It has a base clock of 1,515MHz and a boost of 1,710MHz and 2,944 CUDA cores. The RTX 2080 Ti, on the other hand, has a whopping 11GB of GDDR6 VRAM at the same 14Gbps, but on a 352-bit bus. Its clocks are a bit slower at 1,350MHz and 1,545MHz, respectively. However, it features way more CUDA cores, coming in at 4,352. Just going off of these numbers alone, it’s not hard to figure out that the RTX 2080 Ti is a beefier card, but the RTX 2080 is no slouch, either. Both cards should be able to handle gaming at high resolutions, but how well does each actually cope? This is where things get fun. We’ve been using the RTX 2080 Ti to play all the best PC games over the last couple weeks, and when combined with one of the best gaming monitors like the AOC Agon AG352UCG6 Black Edition or the Asus ROG Swift PG27UQ, you’re in for quite an amazing experience. Both of these cards will provide high frame rates, even at 4K, though not at quite the same levels. In our suite of synthetic benchmark tests, the Nvidia GeForce RTX 2080 Ti was able to score 12,123 points in 3DMark Time Spy and 25,039 in Firestrike. The RTX 2080, in the same tests, achieved 10,139 and 22,027, respectively. In real-world performance, the performance gap is a little more pronounced, especially at 4K. 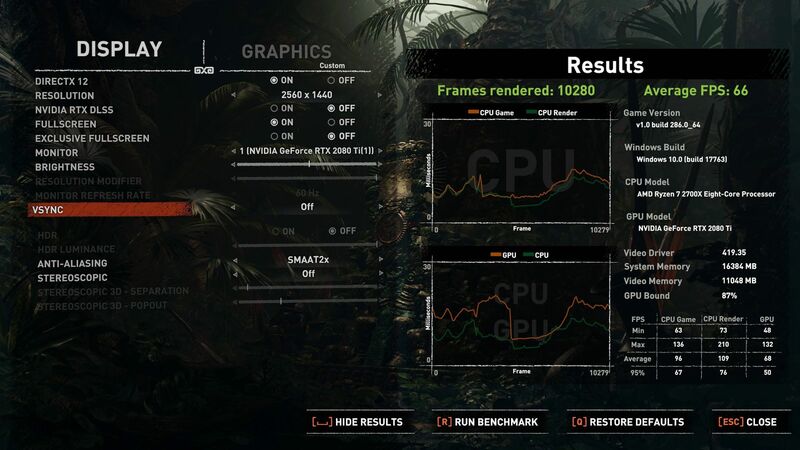 In Shadow of the Tomb Raider, the RTX 2080 Ti almost hit 60 fps at Ultra settings at 4K, scoring an average of 58. In Middle Earth: Shadow of War, also at 4K Ultra, scored a respectable 74 fps average, then in Total War: Warhammer II, it achieved 46 frames – which is impressive given how tough that game is to run. As for the RTX 2080, with the same settings and resolution, it scored 45 fps in Shadow of the Tomb Raider, 59 fps in Middle Earth: Shadow of War and 37 in Total War: Warhammer II. So, while the RTX 2080 Ti is obviously the performance king, the RTX 2080 is no slouch, either – even in the most demanding games at 4K. So, if you’re running a lower-res monitor, say 2,560 x 1,440, you really can’t go wrong with either of these cards – you’re going to get killer frame rates at high settings either way. When Nvidia announced its Turing lineup, it made a huge deal out of two features – ray tracing and deep learning supersampling (DLSS). The Turing architecture has two dedicated cores for these features – Tensor cores for DLSS and RT cores that facilitate real-time ray-tracing. As awesome as these features sound, they aren’t available in many games yet. That’s right, even months after Turing’s initial September 27th release there are only a few games that offer real-time ray tracing or DLSS. Right now, real time ray tracing is only available in three games: Metro Exodus, Shadow of the Tomb Raider and Battlefield V. However, the effects in each of the games are different, you have ray traced global illumination in Metro Exodus, ray traced shadows in Shadow of the Tomb Raider, and ray traced reflections in Battlefield V. These all enhance image quality, but will obviously lower performance. We tested Metro Exodus and Shadow of the Tomb Raider on an RTX 2080 Ti at 1440p. In Metro Exodus, before we turned on any RTX features, we averaged 104 fps. But, when we turned the ray traced global illumination on Ultra settings, that dropped down to 60 fps – that’s a massive drop in performance. Though, DLSS softened that blow, granting us a 73 fps average. In Shadow of the Tomb Raider, we got an average of 93 fps without any RTX features at 1440p, and with ray traced shadows that dropped down to 66 fps. Now, obviously, these results are from the most powerful consumer graphics card on the market, but with the RTX 2080, you can expect a similar performance drop, losing about 20-30%. Both graphics cards can handle ray tracing, though the 2080 Ti is obviously more apt. Which graphics card should you buy? Everything comes down to what games you want to play and at what resolution. If you’re looking to play all the latest AAA games at 4K 60 fps without compromising on quality, you might want to go for the RTX 2080 Ti, even if the price is difficult to swallow. But, if you’re looking for QHD gaming, maybe at a high refresh rate, the RTX 2080 is going to work just fine. You’re going to be able to max out games at that resolution without needing to fork over more than a thousand bucks. No matter which option you go for, you’re getting stellar performance, it’s just a question of how much money you’re comfortable spending. Plus, you can always sell your old graphics card to try and soften the financial blow. 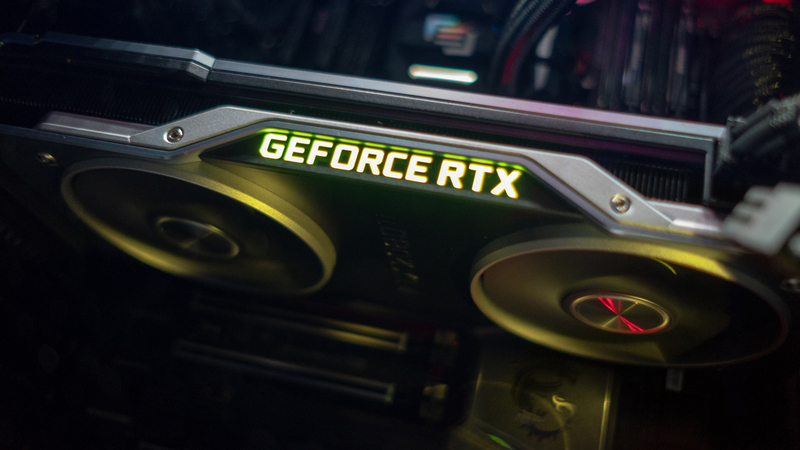 By Bill Thomas| 2019-04-09T16:54:33+00:00	April 9th, 2019|Categories: TechRadar|Comments Off on Nvidia GeForce RTX 2080 Ti vs RTX 2080: which should you buy?